Chess960 (also called Fischer Random) is a chess variant that follows all of the normal rules of chess, but where the large collection of standard opening moves that have been studied over time do not play a large role in the game. This is intended to make the game fresher, more balanced between players of different skills, and to counter the growing role of computers in chess analysis. there must be one rook on each side of the king. The black and white pieces are in a mirrored position. There are exactly 960 possible starting scenarios that follow these rules (thus the name "960"). The only odd rule is with castling: the rules are mostly the same (king and rook cannot have moved and cannot castle through check or in check), with the additional rule that the squares between where the king and castled rook will end up must be vacant from all pieces except the king and rook. 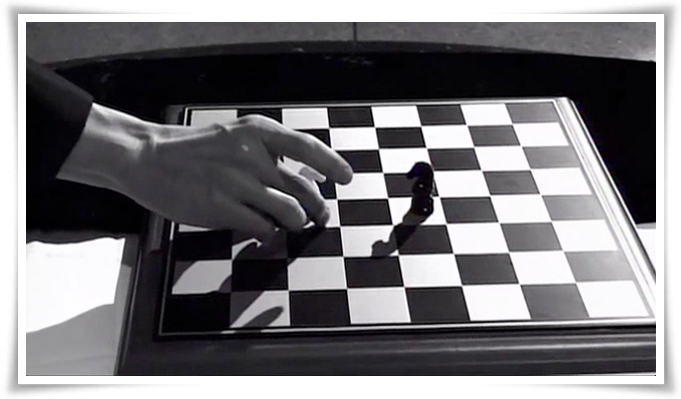 The “Knight's Tour” is an ancient puzzle in which the object is to move a Knight, starting from any square on a chess board, to every other square, landing on each square only once. This is usually considered to be a very challenging puzzle. The website https://en.lichess.org/editor may help you visualize a solution. The eight queens puzzle is the problem of placing eight chess queens on an 8×8 chessboard so that no two queens threaten each other. 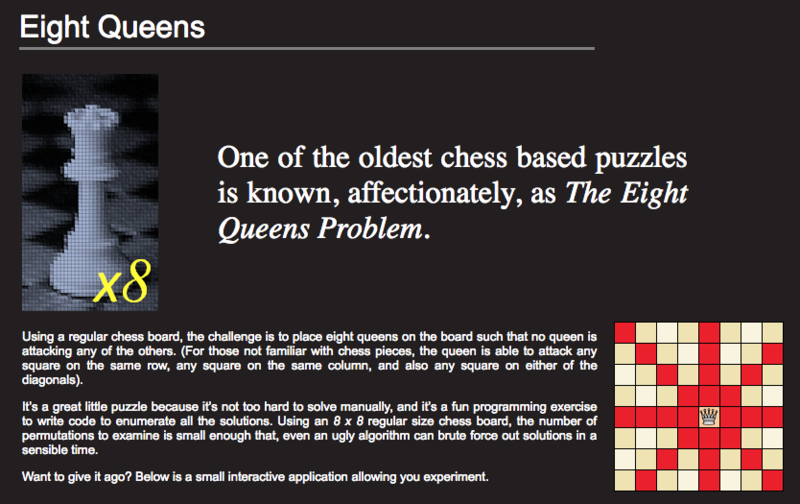 Thus, a solution requires that no two queens share the same row, column, or diagonal. Chess composer Max Bezzel published the eight queens puzzle in 1848. Franz Nauck published the first solutions in 1850. "Mate in two moves!" said the King. But just then a bullet flew through the tent and struck and shattered the rook on g4. The general picked up his sword and rose to leave the table, but the King stared at the board. "Mate in three moves!" said the King. another bullet flew into the tent and smashed the knight on e1. The general froze, but King Karl continued to calmly study the position. 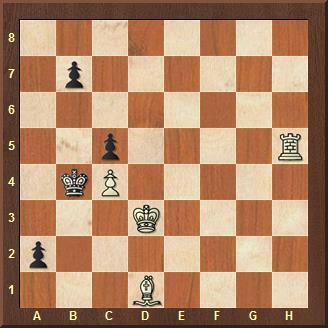 "Well", he said, "then mate in four moves!" a third bullet zipped through the tent and carried away the pawn on h2. a few seconds announced, "Mate in five moves!" The general, his nerves completely frayed, played and watched his monarch execute the mate. ​"What a pity, your majesty, that the second bullet didn't remove your other rook instead of the knight." 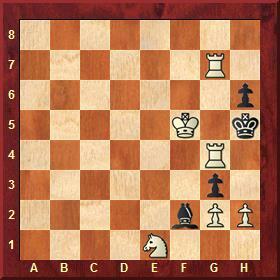 "Then," answered the King calmly, "I would simply have delivered mate in six!" 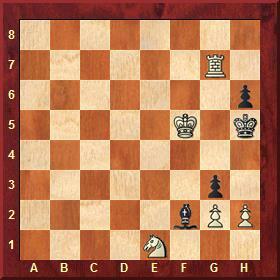 How would YOU have delivered the checkmate in two, three, four, five, or six moves? I. An amateur, who had strolled by the board, whispered to a friend: "The black pawn on a2 is going to queen, and White can do absolutely nothing to stop it. So Black is winning!" II. His friend, a stronger player, didn't agree: "Not at all! White plays 1.Rh7! a1Q 2.Rxb7+ Ka3 3.Ra7+ Kb2 4.Rxa1 Kxa1. It's a clear win for White!" III. At the board White, an expert player, studied the position for a while and then resigned! He stretched out his hand and said to his opponent: "It's quite hopeless, really. After 1.Rh7 you play 1...Ka5 2.Rxb7 Ka6 3.Rb8 Ka7 and I can't stop you from getting the queen. So Black obviously wins." IV. His opponent, who was an even stronger player, accepted his resignation and then, to the horror of the white player, said: "Actually I was just about to resign myself. I saw that after 1.Rh7! Ka5 you simply play 2.Rh8! The a-pawn is lost and the game is over. So actually White was winning."